Because of speeding, it is devastating to note the impact of improper time management that could lead to fatalities on our road. The race to beat time can be a race that may end our brief time on earth. Maybe time is there for a reason. For us to plan, use wisely and sparingly because attempting to cheat it is attempting to play games with the lives of others, which can lead to so much pain. Also, the efforts of some drivers to race on our roads can be dangerous. Heavenly Father, please wake us up, especially drivers in Fiji to follow driving rules because no one wants to exit this earth prematurely through road accidents. Every week and month of the year fatal vehicle accidents happen on our roads claiming innocent lives, but yet drivers keep speeding, disregard speed limits and ignore road rules or do not drive according to road and weather conditions. 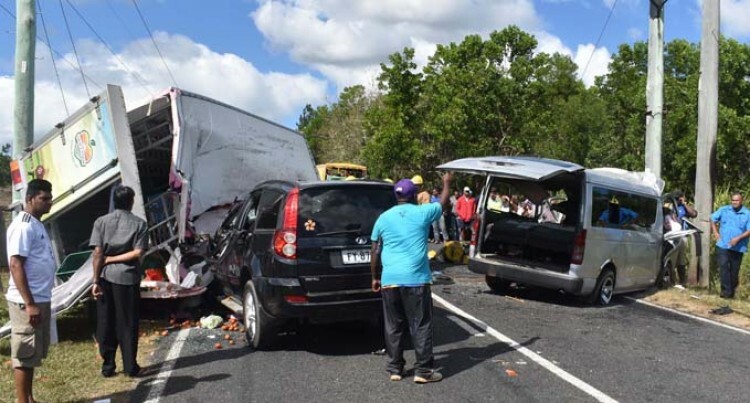 I pray for those who recently lost their lives, those injured because of the three-way vehicle accident at Nabou and their family and friends who will have to bear the pain and loss of this tragic unforeseen departure. Dear God, I pray that through this accident and unexpected tragic loss of innocent lives that You will wake the drivers up, instill fear and a sense of driving responsibility to all of them. Father, this issue on speeding, reckless driving with an arrogant, no fear attitude among some drivers have been continually raised by the Police and the Land Traffic Authority, but it seems to be falling on deaf ears. Lord please, only You can touch the hearts and bring conviction on all drivers, so that every time they sit behind the wheel, they will drive responsibly, so that no more unnecessary loss of innocent lives happen on their watch. Thank You Lord for speaking to drivers through this humble prayer and letter and help us to have a saving relationship with You, because we all do not know when our time expires. Amen. I am wondering as to who is paying for the cost of the above? I refer to the ones being put up around the country. It’s all good, but who is paying? It is good to note the daring promise of the National Federation Party (NFP) to slash the Prime Minister and Cabinet minister’s salaries should NFP win and form the next government. NFP says this promise is part of its desire to save more taxpayers’ monies. It is a very bold statement and undertaking, but will they win and do it? While still on the subject of pay cut for the NFP Prime Minister and their Cabinet ministers should they win, I would like to suggest that the NFP PM be paid the same as the Opposition Leader’s salary. This is a salary scale of $120k with its perks and then Cabinet ministers should receive a $50,000 salary. Please NFP kindly spread ministerial portfolios to all your government members so that not one minister is overburdened or overpaid with four ministries, but get the job done, or better still, match the service delivery by this FijiFirst Government. Their PM can slowly grant them an increase depending on their performance or PMS. I recommend this because NFP is always unnecessarily whingeing about the innovative FijiFirst government salaries and why so many portfolios are being held by one minister. It is all about getting the job done by the best qualified candidate or, simply put, it is in the best interest of the nation. This is because the FijiFirst Government leadership has been playing a catch-up game to make right our past inequities, injustices, discriminations, inequalities and imbalances from post-independence. I would like to ask that Biman Prasad, the leader of NFP, to please register this particular promise in your 2018 party manifesto as a matter of transparency and public interest. I wish to encourage Pio Tikoduadua and Biman Prasad to do the honourable thing and put their mouth where their money is. It will ensure that they certainly gain and command the respect of the wider Fijian community should they implement what they have promised. Please NFP, get all your promises registered so you can be held accountable by Fijians, should you win the election.